I just reseasoned all my cast iron pans, well, most of them. I forgot about the grill pan. It needs to be done now and then, (and I have been putting it off for a while) but I've managed to go 6 years since I bought them! I love cast iron for cooking! I also love exclaimation points! :) Anyhow, cast iron is great for cooking for several reasons. It is great for heat retention and distribution, if seasoned properly it's a wonderful non-stick surface, it's fantastic for slow cooking, and it's a great way to get a little extra iron in your diet. I have a few pans. I use them all the time! I also have a million things on my wishlist :) and they're all at my store. But, cast iron gets a bad rap, I think. And I think it's because nowadays Lodge, and other companies sell "pre-seasoned" cast iron. It's already black! It's beautiful! It's "country"! It's authentic! So we buy it, we use it, and we are really disappointed. Everything sticks to it, it's impossible to clean and then it gets rusty. What's up with that?? Well, I'll tell ya, Lodge puts something on it's cast iron, but it is not the same as the seasoning your grandmother's pans recieved. I'm not really sure what it is, but it needs to be scrubbed off. Now don't get me wrong, I like Lodge. 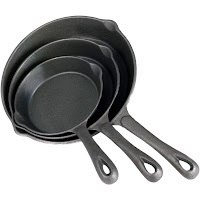 I think all of my cast iron is Lodge, but the first thing you need to do when you bring home that pretty pan is take some steel wool and soap, or use a brillo/s.o.s. pad, and scour that thing with HOT water. Pick up some rubber kitchen gloves if you're not in the habit of using them--you'll thank me later. When you're done scrubbing, it won't look so pretty anymore. It will be mostly a silvery color and maybe a little blotchy. Dry it off real good. Here's a hint I just read somewhere: set it on warm burner for a minute to make sure all of the water is gone. Maybe this practice will keep me from ever having to reseason my pans again, I don't know. But make sure that pan is nice and dry! Then take a paper towel and rub a thin coat of oil onto it inside and out. I've read various types of oil to use: corn, canola, vegetable, whatever. I don't use these a) because when cast iron cooking was the norm these oils didn't exist, so I don't think they are the best options and b) because I don't cook with them. Besides, my good friends (well, I say friends. They don't know me from Adam) Mary and Sally tell me these oils are rancid by the time they're bottled anyway because of the processing they go through! Some great alternatives are nice stable oils. Saturated fats like butter, lard or tallow that are great for high temperature cooking or, if you don't have one of those handy, try some coconut or palm oil. Then stick your pan in the oven, ( I read somewhere that turning them upside down is good, I don't know that it will make a difference.) heated to F 450 or 500 degrees. After about 30 minutes or so turn it off and let it cool with the door closed for several hours. Your pan will be blacker and smoother in appearance. It is now "seasoned". If you like you can repeat the process a time or two, but it is not necessary. You are free to cook in your new "non-stick" pan. Cast iron will last you a lifetime if you take care of it! You should be able to pass it down to your children and grandchildren, and you don't have to worry about scratching it with stainless steel utensils; all you have to do is follow a few simple guidelines. 1. Don't use soap on cast iron, you'll remove your seasoning. Get a nice stiff brush and scrub under hot water. 2. Always dry your cast iron thoroughly. Like I said above, try setting it on a warm burner for a minute to make sure it is really good and dry. Then 3. while your pan is still nice and warm rub some more oil into it. Every time you heat your pan and cook in it you're continuing the seasoning process. Just a side note: I find that when I boil liquid in my pans it seems to affect the seasoning somewhat, so I try use stainless steel or enameled cast iron for those things, but I know there are plenty of people who have cast iron dutch ovens that they use for cooking stew and such and don't seem to have problems so maybe it's just me. Anyway, Enjoy your cast iron cooking! Very interesting. I never knew how to season cast iron. Jeff likes to scrub everything with soap, but maybe if I season the cast iron pan properly he'll agree to try not soaping it up.